Got up early and bought my issue of SpiderGwen vol 1, love the artwork and costume. Fun morning in the SilverSnail. Held by my lovely assistant Frank, I did another doodle YAY! 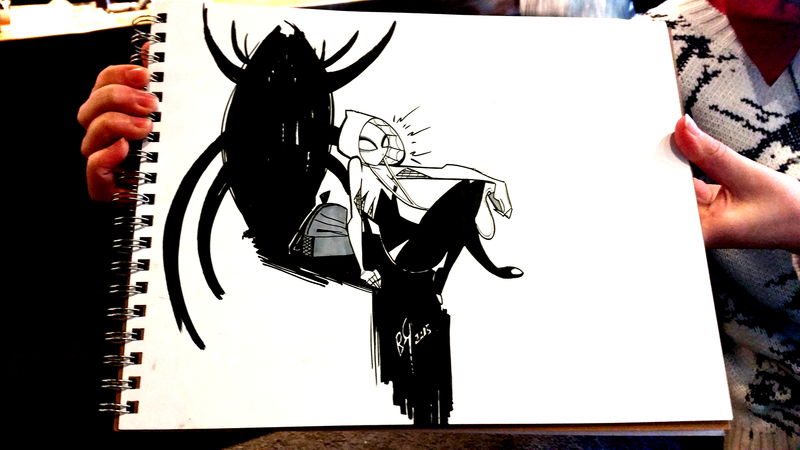 This entry was posted in Uncategorized and tagged comic, comics, Concept, Doodle, Doodles, Drawing, Drawings, Graphic Novel, Hand drawn, Illustration, Illutration, ink, Pencil, Rossi Gifford, SilverSnail, sketch, spiderman, Spiderverse. Bookmark the permalink.